Spoken word poetry centred on issues of the soul, like love and acceptance, accompanied by illustrations that perfectly describe the inner turmoil in one’s mind those form the essence of 25-year-old Rupi Kaur’s art. Born in Punjab, her family moved to Canada when she was just four. She is the best-selling author and illustrator of Milk and Honey and The Sun and her Flowers. Q. Your process in writing Milk and Honey involved sitting down for a week and obsessively completing the book. What was your method for The Sun and her Flowers? A lot slower. I feel like every artist will say this about any of their work but the first one was a favourite. Its organic, you’re not thinking about it, it’s like playing around in a sandbox and if you build a castle then it’s fantastic but when you’re building that castle for the second and third time, you have expectations. While writing Milk and Honey, I had no expectations. Being an author, I just want to express myself. The universe was kind and it ended up doing so well and I suddenly had a publisher and an agent and a team. I got a book deal and I decided that I had to write a book, but how? I didn’t know how to write one. Looking back at the first one and how well it has done — I’ve thought about this for so long — I felt like I had my hands tied behind my back because I’m trying to recreate and find the recipe to success. I struggled with that for a very long time until I found that the recipe was honesty. Milk and Honey was created through this fearless energy and I was completely honest with myself. So, the process for The Sun and her Flowers was again to be just completely honest with myself and not control the process so much. Once I did that, it got a lot easier because I told myself that it was my job to open a new page each day and just write. My job was not to be perfect or write a masterpiece but just write and let it flow. Q. How do you come up with the illustrations in the book? I have been drawing and painting since I was five years old and always wanted to be a visual artist in spoken word poetry and poetry in general. That month I spent a lot of money on paint and my mother was so mad at me because I should have been saving for university but I was spending on art supplies. And they’re still in my basement and as soon as she bought them for me I fell in love with painting but I didn’t open any of them! I felt so guilty after two years because I felt like I cheated on my first love, which was writing and I wanted to know if there was a way I could bring the two together and that’s when the idea of illustrations came. What I do is I write the poem and then close my eyes — the first imagery or feeling that comes to my mind, I draw that. It’s a natural response to what’s happening in my mind. Q. Other than your mother who is an inspiration for The Sun and her Flowers, is there anyone else you look up to? There were a lot of older family friends I looked up to because being a young girl, I was not comfortable in my own body and I did not know what was right or wrong and Indian culture differed a lot from that of the West. My home at that time had a certain idea about what a woman’s body should look like and what a girl is allowed to do in contrast to when I’d leave my house and how western society would have rules about what I can and cannot do about my body. Nobody was asking me what I wanted to do with my body. Then I’d see these older family friends who were 17 years old and they’d be dancing and having a good time. I’d look up to them and want to be like them. I remember seeing pictures of Amrita Shergill and going wow. Those are very inspiring women because they rejected what society expected of them and did what they wanted to do and shared their magic with the world. Q. Do you think you’d write a novel or short stories someday? I do. I have ideas for short stories all the time. I simultaneously work on all this stuff and I want to write prose. People think it’s really easy to compact your thoughts into short verses of poetry. Sometimes, I feel like I just need to write a novel to describe this one thing. Q. Do you have any advice for young writers still finding their way? Practice because it outweighs talent and you need to hone your craft. Do what comes naturally to you. I see that with poetry a lot, there’s a tone in which it has to be written but with spoken word I was free to come into my own voice. Poetry comes through my body. I do what comes naturally and you need to be true to who you are. Q. How do you learn to accept yourself? It’s a process and a cycle — there are good days and bad days. We just need to understand that nobody has it together all the time and that pain happens to everyone and we’re not alone in these emotions. I’m reading Elena Farrante’s My Brilliant Friend. Q. How do you navigate the Internet? I don’t read the comments — good or bad. The magic or the recipe to writing doesn’t depend on what other people are saying because it will strip away my honesty and the ways in which I write. That said, it’s a beautiful platform where I can go and share beautiful things. I listen to Sufi, Punjabi folk and old Hindi music when I want to get in touch with my heart and soul. When I’m trying to do the same with English music, I listen to Frank Ocean, Sam Smith or Adele. When I’m trying to get things done I listen to Beyonce and Drake. Their albums were on repeat when I was writing Milk and Honey, so I have a nostalgic connection to them. Q. What do you do for fun when not writing? I love going out and eating and if I can squeeze in a night of dancing then that is fun but I love being surrounded by people. When I go on tour, I miss my friends a lot so when I’m home I try to see how many people I can hang out with all at once. That’s when I feel the most like myself, when I’m surrounded by family and friends. 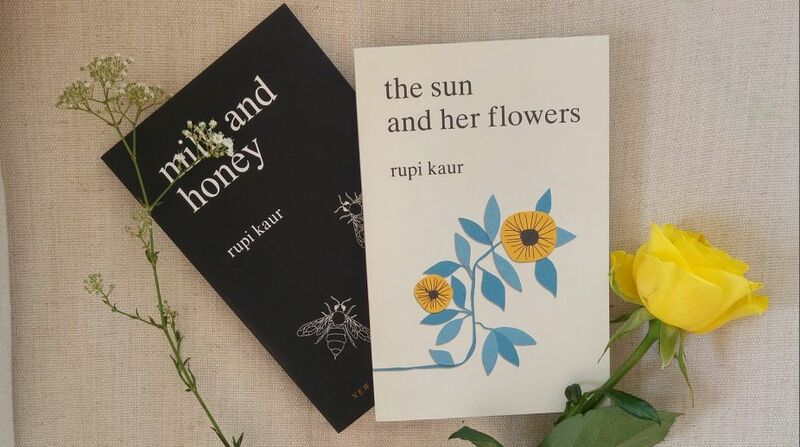 Spoken word poetry centred on issues of the soul, like love and acceptance, accompanied by illustrations that perfectly describe the inner turmoil in one’s mind — those form the essence of 25-year-old Rupi Kaur’s art. Born in Punjab, her family moved to Canada when she was just four. She is the best-selling author and illustrator of Milk and Honey and The Sun and her Flowers.